“Oreo‘s newest flavor isn’t as crazy as their usual offerings—and even more surprising, it’s here to stay. The beloved cookie company announced on Wednesday that Dark Chocolate Oreos will become a permanent flavor hitting shelves next year. The brand decided to announce the news timed to the upcoming winter solstice, the day with the shortest period of daylight (so the darkest day of the year), on Dec. 21 even though the cookies won’t hit stands until Jan. 2. The South Street Seaport restaurant will channel a winter chalet and features special dishes like a “gingernut pizza,” made with ginger crust, eggnog frosting, spicy pecans, candy canes, and sprinkles. 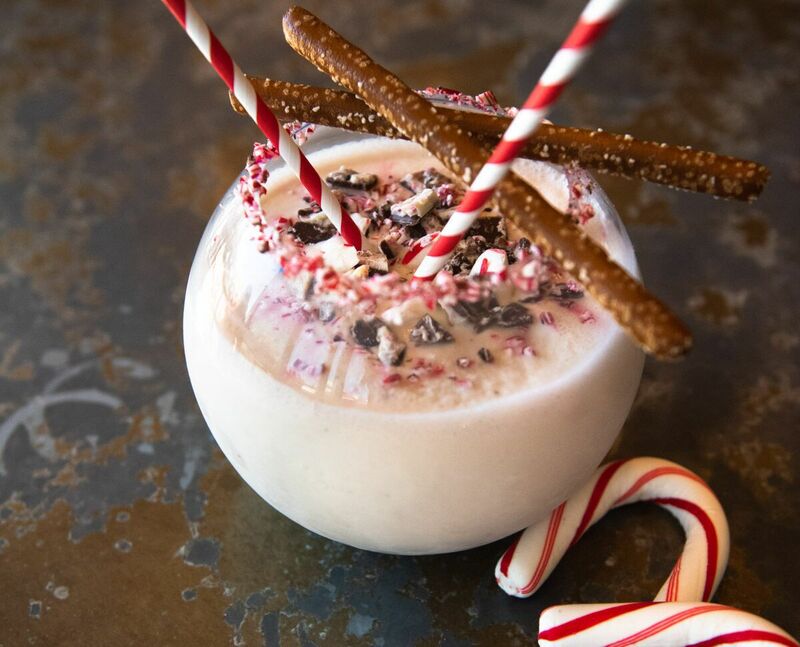 Drinks include a large format frozen cocktail made with Baileys, candy canes, peppermint bark, and pretzel rods. The spiked hot chocolate has Nutella. Now open at 70 South St.
“Nutella stans of the eastern seaboard, your time has finally come: the Nutella Cafe in New York City opens on Nov. 14, in all of its ridiculously decadent, Instagrammable glory. In case you have not also been tracking this cafe so intensely that employees at Google are probably concerned about your Nutella search history, a bit of background: in June, Ferrero announced the opening of a Nutella cafe in the Big Apple, marking the second such cafe in the U.S. after the original opened in Chicago in 2017. The menu at the Chicago location is already drool-worthy enough — now, many of those fan favorites are about to hit the New York location, which also includes new menu items that will make your Nutella-loving heart sing. “For the first time ever, Krispy Kreme has released the Trick-or-Treat Doughnut—a scary good mashup of candies and doughnuts. This new creation features an Original Glazed Doughnut dipped and drizzled in salted caramel and topped with pieces of some of your favorite chocolate Halloween candies. The Trick-or-Treat Doughnut joins another new creation, the all-new Monster Batter Doughnut, featuring a classic cake batter filling, dipped in slime green icing and topped with monster eyes and festive confetti. These two new doughnuts join Krispy Kreme Halloween fan favorites the Jack-O-Lantern Doughnut, and the Chocolate Iced Doughnut with Halloween Sprinkles. To view more restaurants offering Halloween promotions click here. Reservations at the most romantic restaurants in the city fill up quickly in the weeks before Valentine’s day, but it’s important to remember that this holiday – thankfully placed in the middle of the coldest months, when we all need a little celebration – can really be celebrated with loved ones of all sorts. At The Chocolate Room in Brooklyn they know this well, and it’s equally possible to share the joy of a spicy hot cocoa with your sweetheart as it is a banana split with your 3-year-old niece or a chocolate stout with your best friend. In fact, you can do so any time of year and be greeted with the same recipe of warmth and decadence – although they’re particularly busy these first weeks of February. Walking inside, guests often remark on the smell of chocolate coming from open kitchen – the first invitation to stay awhile and try as much as possible. This is matched with an equally chocolatey color scheme of dark brown and red. After the smell, the first thing most guests notice is the chocolate case – brightly lit and well stocked with confections. In the weeks before Valentine’s day, there is a staff member available just to help guests assemble custom chocolate boxes from their favorite truffles inside. The retail side of operations might be front and center, but The Chocolate Room also wants to keep you out of the cold; they take no reservations but provide table service during both the day and evening. Each shop has bar seating where you can watch desserts being assembled, as well as small tables that are sometimes pushed together for children’s birthday parties, and other times pulled apart and candle-lit for intimate evenings. There are no savory items on the menu, but there is something for every sweet tooth – from overflowing brownie sundaes to elegant flourless chocolate cake. Each menu item also has a suggested wine or beer pairing on the menu, like dark chocolate stout from Brooklyn Brewery or a Graham’s tawny port. The wine pairings and low evening lighting make one thing clear: this is a romantic spot, the perfect place to take your date post-dinner when you’re not ready for the night to end, but you don’t feel like heading to a noisy bar. But just like its namesake, The Chocolate Room strives to be universal, and very kid-friendly. There is no hard alcohol served, but there are plenty of child favorites and kid-sized scoops of homemade ice cream. Appealing to both families and couples is no easy task – but it does explain how The Chocolate Room keeps the hot cocoa flowing at all hours during these cold winter months. Take Aways… It can be difficult to bridge the gap between daytime family fare and nighttime romance, but doing so means you can put a smile on twice as many guests faces. The Chocolate Room begins with a concept that appeals to everyone, and then carries it out with a range of menu options and a warm, relaxed atmosphere. The Chocolate Room has two locations: 269 Court St, Brooklyn, NY 11231 and 51 5th Ave, Brooklyn, NY 11217. Tomorrow, the much-anticipated Dominique Ansel Kitchen will open its doors to the West Village. 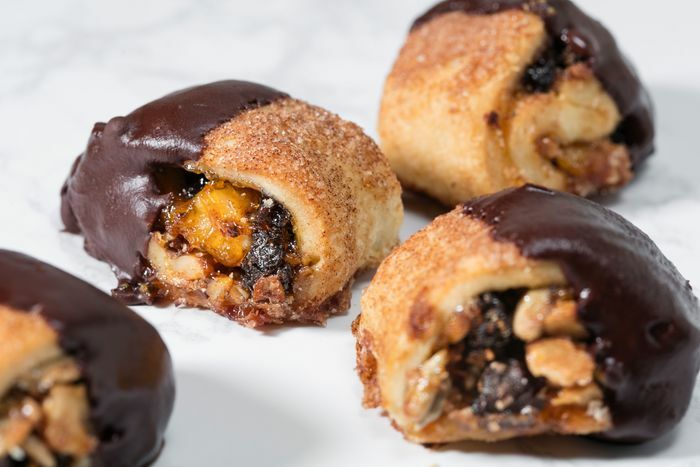 The Cronut king has taken the industry by storm developing hybrid desserts and he plans to take things to the next level with his newest endeavor. Dominique Ansel Kitchen will be the first of its kind bringing bakery retail together with restaurant service. According to their newly launched website 70% of the menu will be made to order. Dominique Ansel names time as an ingredient, placing importance on the care and process that goes into each pastry. The bakery vows to offer the “best and most genuine versions of pastries…at the perfect time for you to eat it”. Menu speculation includes chocolate mousse, baba au rhum, beignets, mille-feuille and very buttery lemon tarts that are all prepared a la minute with a one to two minute prep time. Additionally, the bakery will offer savory options including garlic bread croissants and béchamel filled squid ink toasts. Ansel announced earlier this month that 26-year-old Karys Logue would be his Executive Chef overseeing both Dominique Ansel Kitchen as well as the original Dominique Ansel Bakery. Logue first crossed paths with Ansel when they worked together at Daniel and since she has perfected her skills as sous chef at Café Boulud as well as executive pastry chef at Sepia and Tessa.